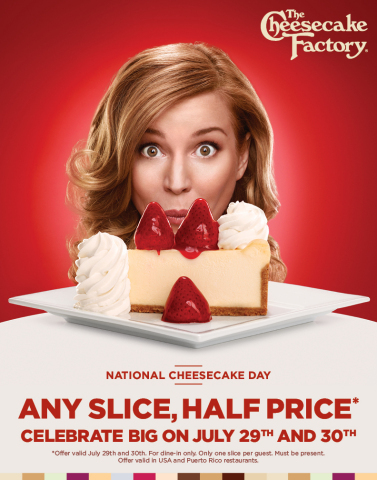 CALABASAS HILLS, Calif.--(BUSINESS WIRE)--The Cheesecake Factory® will celebrate National Cheesecake Day in a big way on July 29 and 30 by offering dine-in guests any slice of its more than 30 legendary flavors of cheesecake for half price at any of its 189 restaurants nationwide. 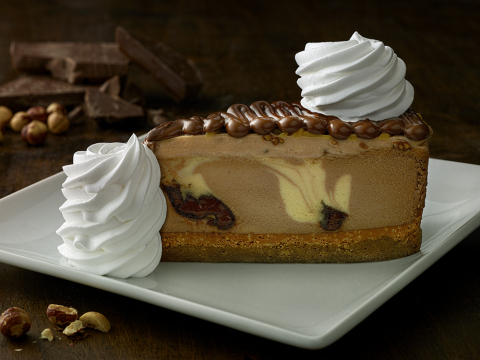 * To make the holiday even sweeter, The Cheesecake Factory will also debut its newest creation – Chocolate Hazelnut Crunch Cheesecake topped with hazelnut crunch and Nutella® on a blonde brownie crust. The new cheesecake will be available beginning Friday, July 29. *One slice of cheesecake per dine-in guest. Must be present. Offer valid at restaurants in the U.S.A. and Puerto Rico. The Cheesecake Factory Incorporated created the upscale casual dining segment in 1978 with the introduction of its namesake concept. The Company, through its subsidiaries, owns and operates 202 full-service, casual dining restaurants throughout the U.S.A. and Puerto Rico, including 189 restaurants under The Cheesecake Factory® mark; 12 restaurants under the Grand Lux Cafe® mark; and one restaurant under the RockSugar Pan Asian Kitchen® mark. Internationally, 12 The Cheesecake Factory® restaurants operate under licensing agreements. The Company’s bakery division operates two bakery production facilities, in Calabasas Hills, CA and Rocky Mount, NC, that produce quality cheesecakes and other baked products for its restaurants, international licensees and third-party bakery customers. In 2016, the Company was named to the FORTUNE Magazine “100 Best Companies to Work For®” list for the third consecutive year. To learn more about the Company, visit www.thecheesecakefactory.com. The Cheesecake Factory will offer dine-in guests any slice, half price on July 29 and 30 in celebration of National Cheesecake Day while also debuting its newest cheesecake creation on July 29.